194 Kensington Park Road, Notting Hill, London W11 2ES. 13 Northcote Road, Clapham, London SW11 1NG. Tel +44 20 7924 5488. 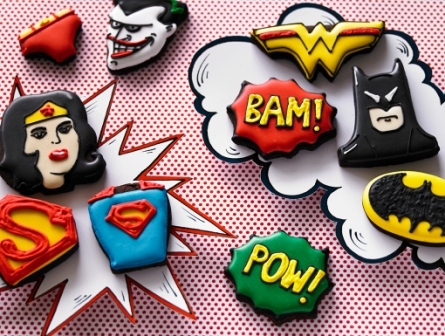 For a cookie with ‘Kapow’, you can’t beat this stunning Super Hero Biscuit Collection by master bakers Biscuiteers that is jam-packed – or maybe sugar-laden – with an elite trio of DC Comics heroes of Batman, Superman and Wonder Woman and an assortment of super-duper super-hero accoutrements. From the moment the lid is lifted, a delicate waft of chocolatey goodness wafts in the air. The lucky recipient who gets to unwrap is in for a real treat as layer upon layer of dark card reveals a different set of DC Comics classics from the iconic logos of the golden S for Superman and the outstretched wings of the dark knight Batman to the golden monogrammed belt of Wonder Woman to the sleek bat mobile. There’s a touch of pop-art onomatopoeia with the cookies emblazoned with kitsch action words: Wham! Bam! Zap! and Pow! This is an extra-large family tin, designed to be shared. 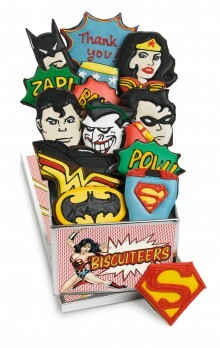 We’ve gathered the best in the DC universe to bring you our exclusive Super Hero Biscuit Tin. Inside our hand-illustrated gift tin you’ll find Superman, Batman, Robin, Wonder Woman, the Joker and a host of super hero biscuits. This tin is designed for super-heroes everywhere. Make this extra-special by adding a personalised message, which we’ll hand-ice onto the starburst biscuit in the tin. To add a hand-iced message onto this tin just select the personalised option from the drop down. Fun fact At Biscuiteers HQ in London, the team of icing artists make around 4,000 biscuits a day and through over 200 bags of icing. Designer Details Biscuiteers was founded in 2007 by Harriet Harris and Stevie Congdon as a luxury online biscuit boutique, selling biscuit greeting cards and themed tins of iced biscuits. 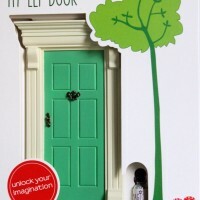 They also have two Boutiques and Icing Cafes in London, where they hold baking master classes for children and adults. Biscuiteers are sold in some of London’s finest stores, as well as at Galeries Lafayette, Colette and La Grande Epicerie in France, Greece and Dubai. They also deliver worldwide.